Aadhar no. or other personal information is hidden from public view - DoPT Orders. 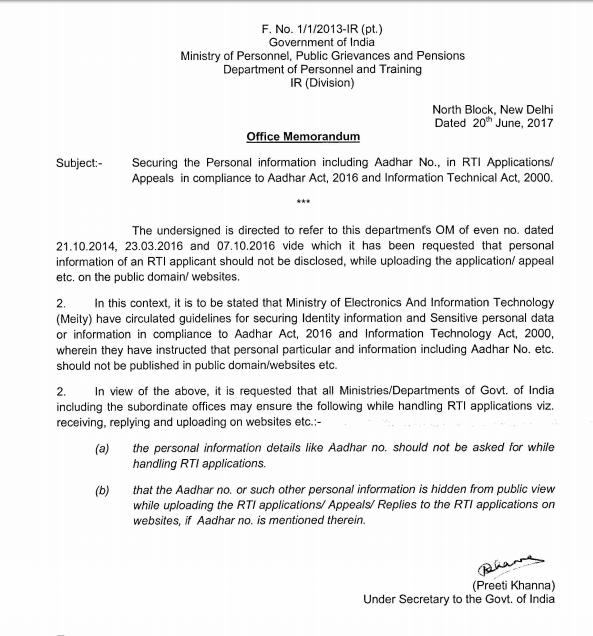 Securing the Personal information including Aadhar No., in RTI Applications/Appeals in compliance to Aadhar Act, 2016 and Information Technical Act, 2000. Personal particular and information including Aadhar No. etc. should not be published in public domain/websites etc. The undersigned is directed to refer to this department's OM of even no. dated 21.10.2014, 23.03.2016 and 07.10.2016 vide which it has been requested that personal information of an RTI applicant should not be disclosed, while uploading the application/ appeal etc. on the public domain/ websites. (a) the personal information details like Aadhar no. should not be asked for while handling RT/ applications. (b) that the Aadhar no. or such other personal information is hidden from public view while uploading the RT/ applications/ Appeals/ Replies to the RT/ applications on websites, if Aadhar no. is mentioned therein.